Purchase Your New Home With No Money Down!! Have you considered purchasing a new home but feel that your biggest obstacle is coming up with the down payment? For many, this is reality, but thanks to the USDA Guaranteed Home Loan, it’s possible to purchase your dream home with no money down mortgage. Thanks to USDA Guaranteed Home Loan, you can receive 100% mortgage financing. The U.S. Department of Agriculture’s Rural Development Guaranteed Housing Loan Program, also known as a USDA loan, offers 100% financing for moderate-to-low income homebuyers in eligible rural and suburban areas. The program, originally designed to help rural Americans realize the dream of homeownership, offers many benefits that are not available with other loan programs and the ability to buy a home with no money down mortgage. Many wonder how to buy a house with no money down as a 100% financing first time home buyer. This program is used by many first time home buyers, but the great news is it can be used by many other buyers too. What are the Key Benefits of a USDA Loan? The ability to pay nothing out of pocket for a down payment and get 100% financing home loans is one of the greatest benefits of the program. The no money down feature has allowed many people to buy a home that would otherwise not qualify. Additionally, the USDA Loan allows borrowers to use a gift or grant to go toward their mortgage if available. These benefits make USDA loans perfect for first-time home buyers. Because a USDA Loan is guaranteed and insured by the U.S. Government, banks and mortgage companies are able to offer USDA loans at very low rates; there is less risk to lenders if the borrower defaults on the loan. Competitive 30 and 15 year fixed interest rate products are available. Private mortgage insurance is always required for any loan with less than a 20% down payment, regardless of the specific loan program. The good news and benefit of the USDA loan is that its PMI rate is one of the lowest of any loan program and doesn’t change for the life of the loan. Currently, the USDA loan’s PMI annual fee is 0.35 percent, based on the loan’s remaining principal balance. USDA offers flexible credit underwriting requirements for low to moderate income borrowers. Your credit score will determine if you’re eligible for any loan. Before offering 100% mortgage financing, USDA considers financing based on the financial situation for the homebuyer. The loan also allows some borrowers with blemished or limited credit histories to qualify for home financing. Lenders may accept “alternate” tradelines, such as rent, utilities, cell phone bills, etc. to represent a payment history if the borrower’s credit history is too short. As with FHA and VA loans, USDA loans also require an upfront premium, which is 1 percent of the loan amount. The USDA allows borrowers to roll this fee into their financing and close on the loan without putting any money down. USDA loans allow the seller to pay for the buyer’s closing costs, up to 6% of the sales price. Gift funds from family members are also allowed to cover closing costs with proper documentation. If the appraised value of the property comes in more than the purchase price of the home, USDA will provide 100% financing home loans on the full amount of the appraised value. The borrower can use the excess funds to finance closing costs. 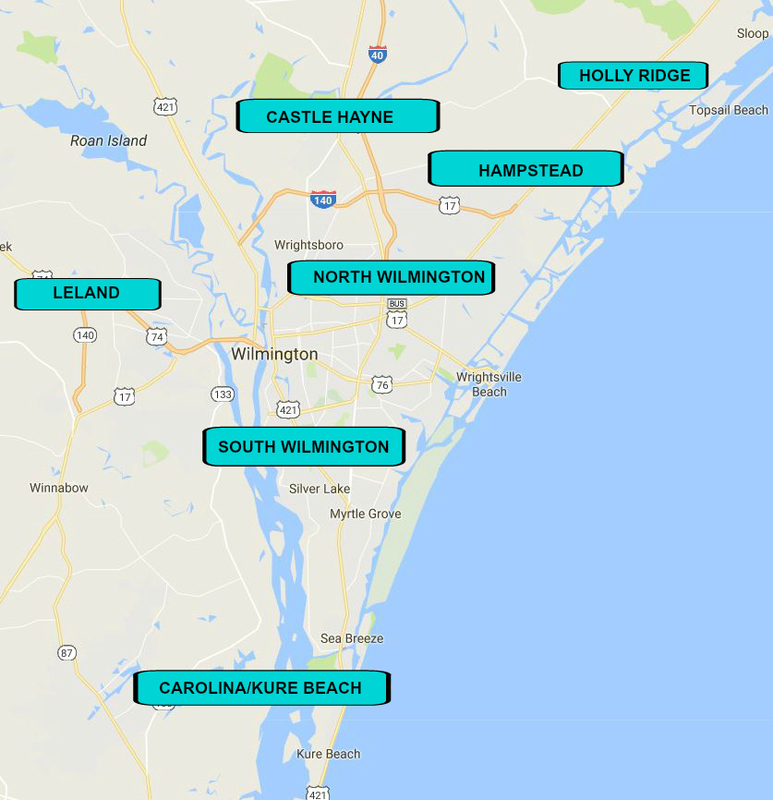 Click on a location in Wilmington, Leland, or a surrounding area to see which homes are available for USDA 100% mortgage financing. Verify if you meet the USDA income limit requirements. For the local market, the income limit for households with 1-4 family members is $78,400.00 or $103,500 for a family of 5-8 people. Demonstrate the ability to repay: Your monthly housing payment including principal, interest, taxes and insurance must be 29% or less of your monthly income. Other monthly debt payments you make, including housing expense, cannot exceed 41% of your income.